Geriatricians are on the front lines of treating people with Alzheimer’s disease, an age-related neurological disorder that currently affects as many as 5.1 million Americans. But caring for patients with the condition presents its own unique challenges, due in part to Alzheimer’s complexity and the limitations in both currently available diagnostic tools and treatment options. With an estimated 8.7 million Americans at risk of developing Alzheimer’s by 2030, if healthcare professionals do not find ways to treat or delay this devastating disease, the future looks daunting. But there is room for optimism on many fronts. The federal government is leading an increasingly robust research effort into the causes of, treatments for, and prevention of Alzheimer’s disease and related dementias. Following the enactment of the National Alzheimer’s Project Act in 2011, the National Institute on Aging established its first national plan this year to help change the trajectory of this looming health crisis. Although led by the US Department of Health and Human Services, the National Plan to Address Alzheimer’s Disease requires the active engagement of the entire Alzheimer’s community—from patients, families, and healthcare providers to advocacy groups and state and nonprofit agencies—to reach its research-focused goal of developing effective prevention and treatment options by 2025. Geriatricians in particular can play a vital role in advancing the understanding of Alzheimer’s by assessing the cognitive health of their older patients and, when appropriate, encouraging their participation in a clinical trial or other research study. Today at least 50,000 volunteers, both with and without Alzheimer’s, mild cognitive impairment, or related dementias, are urgently needed to participate in more than 120 actively enrolling clinical trials and studies in the United States. To reach that goal, researchers will need to screen at least 500,000 potential volunteers. An important first step in reaching these volunteers is often a primary care physician’s assessment of a patient’s cognition. The assessment may be triggered by memory complaints or other symptoms such as problems with word finding. Many cognitive screening tools take 10 minutes or less to administer. Commonly used tools that are given to the patient include the Montreal Cognitive Assessment, Mini-Cog, the General Practitioner Assessment of Cognition, and the Mini Mental State Examination. An alternative brief tool is the AD8, which requires a family member or caregiver to answer eight yes or no questions about the patient’s cognitive function. 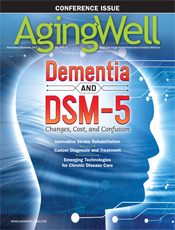 The American Academy of Neurology guidelines on dementia provide some background as well as other suggestions for assessment tools. Positive screening results indicate the need for further evaluation, to include a medication review, laboratory tests to help exclude thyroid or other disorders, and neuroimaging to rule out stroke, tumors, or other brain injuries. At this stage, the many benefits of volunteering for a clinical trial or study could be discussed with the patient and family members who might be at increased risk for developing the disease. Volunteering for an Alzheimer’s clinical trial is not for everyone; it requires a commitment of time and effort and may be difficult for families dealing with the already heavy demands of caring for someone with Alzheimer’s. Furthermore, as with any trial, there is an element of risk, and few volunteers directly benefit from participating. However, the rewards of volunteering can be equally significant. A participant receives regular monitoring and care at leading research centers, learns about both the disease and current research efforts, and may benefit from easy access to support groups and other resources. Above all, many volunteers value their participation because it may one day lead to therapies to treat or delay the disease. Referring physicians also may benefit from the close ties they build with research centers and raised awareness of cutting-edge research. Clinical trials are seeking broad participation from men, women, whites, blacks, Latinos, Native Americans, Asian Americans, people with Alzheimer’s or a family history of the disease, people with mild cognitive impairment, and—importantly—people who are symptom free. There are several excellent online resources available to assist your patients in determining whether joining a trial or study is right for them. — Neil S. Buckholtz, PhD, is director of the division of neuroscience at the National Institute on Aging in Bethesda, Maryland, which funds an infrastructure network and individual research grants ranging from basic science to clinical prevention trials. • Complete list of clinical trials and studies available through the Alzheimer’s Disease Education and Referral Center. Additional information is available by calling 800-438-4380 or e-mailing adear@nia.nih.gov. E-alerts with news about trials and studies also are available. • ResearchMatch, a free online service that connects volunteers to clinical studies at the National Institutes of Health Clinical Center and other institutions.